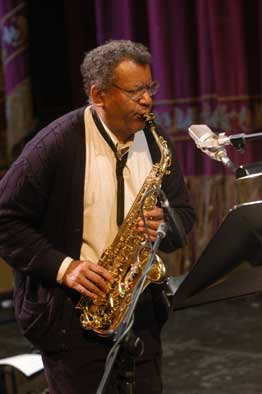 Firehouse 12, 45 Crown Street in New Haven, presents Anthony Braxton's newest project, a septet venture that carries the sobriquet Echo Echo Mirror House. The good Professor (playing saxophones and clarinets for these shows), who has been on the faculty of Wesleyan University for over 2 decades, has written new music for conventional instruments and musicians wielding iPods. Joining him will be Aaron Siegel (percussion), Carl Testa (bass, bass clarinet, electronics), Mary Halvorson (guitar), Jessica Pavone (viola, violin), Jay Rozen (tuba) and Taylor Ho Bynum (cornet). All the advance tickets for both the 8:30 and 10 p.m. shows have been sold out (and have been for a good long time) so the folks at the Firehouse suggest you write (info@firehouse12.com) or call (203-785-0468) to get your name on the waiting list. To get more information, go to www.firehouse12.com. Pianist/scientist Jean-Michel Pilc has issued his second solo CD, "Essential" (Motéma); the 18 tracks (just under 67 minutes) run the gamut from standards ("Caravan", "Take The A Train", "Too Young To Go Steady" and more) to the "Waltz in A minor" by Chopin to a 6-part series of "Etudes" and beyond.) Much of this program is quiet and intimate, a lovely series of audio dreams for the end of the day. Even the Ellington and Strayhorn pieces are softer and a bit more abstract that one might expect. The music is in no way somnambulance personified. A good example is "Caravan" - here, Pilc takes the tune through a number of tempo changes, from a bluesy stroll to an out-of-time romp. "Someday My Prince Will Come" moves easily under Pilc's fingers, with long flowing lines moving in and around the melody. He even summons up the spirit of Art Tatum at one point in his pleasing rendition of "I Remember You." One of the more impressive pieces is the pianist's abstract on "Blue in Green", slowly unfolding from the opening notes, not hurrying forward but lightly treading on the melody. The 6 short "Etudes" ,broken up into numbered "Tableaux", have the feeling of being improvised and, at times. may remind some of the ramblings of Keith Jarrett. Yet, because these are brief, none overstay their welcome. From the rumbling bass lines of "No.1" to the child-like melody line of "..2" to the abstract ballad that is "..3" and on, this is the creative essence of the pianist. He moves gracefully through the pieces (as he does through most of the program) and one feels comforted, almost cuddled, by the generous chords and lilt of "..6." "Essential" is a title that may raise questions in some listeners' minds about the CD's place in Jean-Michel Pilc's oeuvre (he has issued several other excellent recordings) but it may be that this was the right time for an album such as this. Don't think about it too much, just enjoy the width and breadth of Pilc's talent and artistry. CD buyers get an extra treat with a short video of Pilc at the piano. For more information, go to www.jmpilc.com. Received a note from vocalist Kendra Shank about a courageous and inventive creative musician - read it, follow the link and pass it on. "I'm singing in this film documentary about guitarist Sangeeta Michael Berardi (pictured left) who, since contracting Parkinson's disease, continues to make music by utilizing his tremors in creative ways. An inspiring man, who has much to teach us about living. You can see the film trailer and donate to the project by clicking on the link below. One of the gift options for those who pledge, is an autographed copy of my CD "A Spirit Free: Abbey Lincoln Songbook." Please direct all inquiries about the project to burrillcrohn@earthlink.net."